Every aspect of the program works together to emphasize the same Bible subject being covered on the same night in the adult evangelistic series. Songs—The power of the Word of God is combined with the power of music to fix each truth presented in the minds of the children. 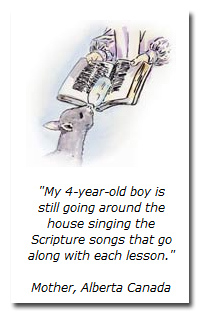 In each program the children learn a new Scripture song which emphasizes that evening’s topic. These songs are taught using illustrated slides on PowerPoint, fun hand motions that get them involved in more than just singing, and are accompanied by the piano. Health Nugget—Whenever possible we try to connect the health nugget with the spiritual theme in some way. Short stories, activities, experiments, and instruction make this a time children always look forward to. Interest is added to the health nuggets through illustrations in “The Body” felts and/or PowerPoint pictures. Creative review quizzes are also formed in PowerPoint which challenge the various learning levels. The depth of the health nugget is adapted to the age group. Nature Corner—Real-life nature experiences and discoveries are opened to the children in a variety of creative ways. The spiritual object lessons drawn are adapted to their age and unlock the Bible message, making it clearer and more readily called to mind. Reinforcement Activities—Children must do more than sit and listen. Many learn by doing. These activities, adjusted to the age group, give the children a hands-on opportunity to participate in the topic being taught. 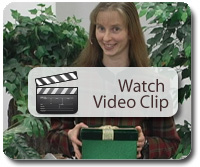 Bible Message—A Bible story(s) is used as the channel through which to present the same evangelistic topic as covered in the adult meetings that evening. The depth of the subject is adjusted to the age of the children. Throughout the Bible message children look up key Bible verses in their Bibles and read them. Animated felt imagery holds children on the edge of their seats. Appeals are made; response cards filled out. 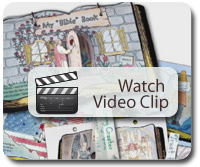 Memory Verse—During this time not only do the children learn the new memory verse for the evening, but also the memory verses from previous programs are reviewed in creative ways. PowerPoint activities make this a lot of fun. Craft Activity—Here children make a special craft “Bible Book,” adding a new page at every program they attend. Each page directly corresponds with and reinforces the theme covered in that program. It also proves as an incentive for attendance and gives children a tool by which they can share what they are learning with family and friends. These are crafts I’ve found children to treasure.